I have been contemplating when might be the best time to blog about my entry into the Fashion Less Waste 2011 competition, held by the Australian Museum. Competition entries are now closed, and judging has taken place. Sadly I didn't make it to the finals this year, but that's OK, the open category encourages fashion designers to enter, which clearly I am not, but it is good to try these things, right? 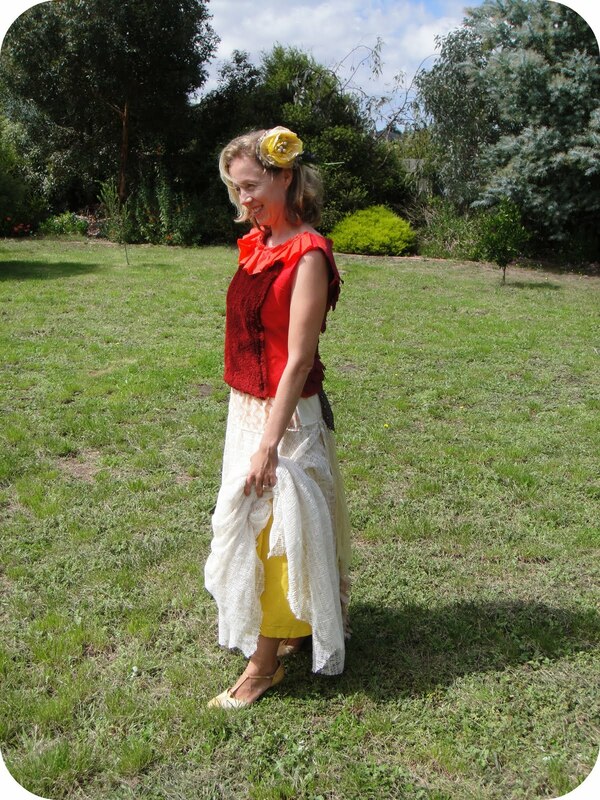 Fashion Less Waste 2011, aims to encourage a more sustainable fashion industry, to help fashion a less wasteful world. This year, entrants were invited to be inspired by the birds of paradise. The instructions are to make an outfit that "is entirely, or mostly, made from materials that were originally bought and used for a non-clothing purpose." 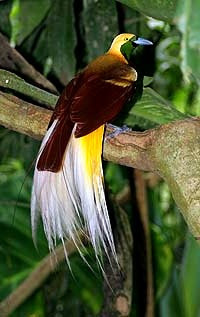 My entry was inspired by the Lesser Bird-of-paradise; Paradisaea minor, distributed throughout forests of northern New Guinea. 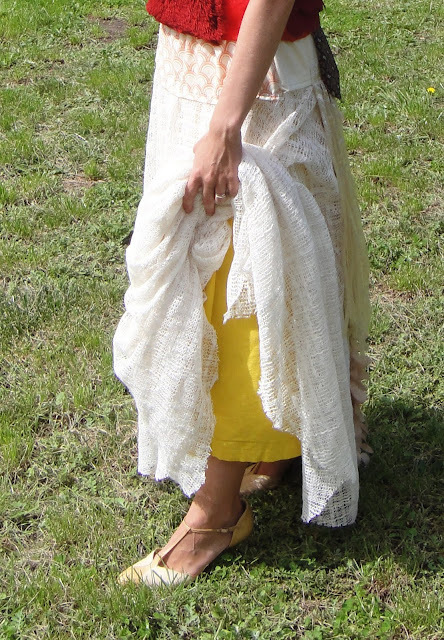 I created the skirt with material from a friend’s unwanted white curtain, the waist band is made from a vintage pillowcase with elastic waist, and the rear is decorated with a second-hand scarf, and a plastic sheet cut into strips. The yellow undergarment skirt used to be a canvas chair cover, with a reclaimed zip from my sewing box. The base of this top is from red reusable grocery bags. 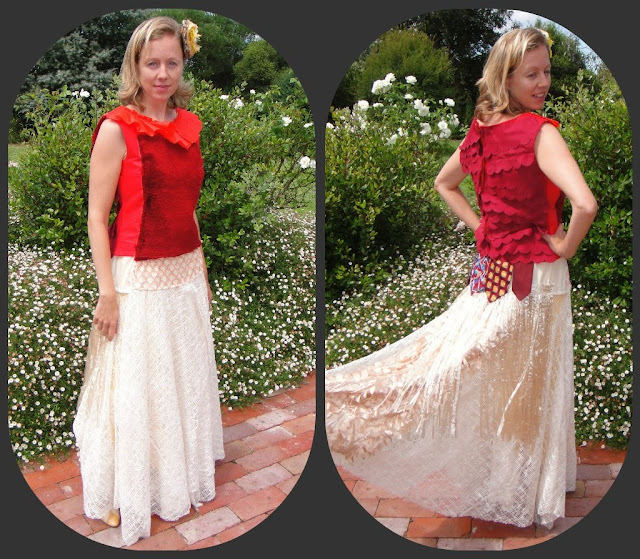 I used a fluffy red for the ‘chest’ panel; the zip at the back of the top is from the same cushion cover. 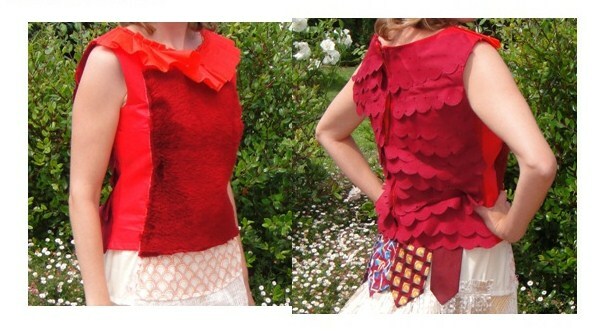 Frills around neckline made with remnants of red reusable grocery bags, and the back is decorated with frills from a table cloth, and the tips of four men’s neckties. I'm actually looking forward to seeing the finalists' outfits, as it is a very inspirational competition! And maybe I'll enter again next year. Very impressed Erica. It's inspiring seeing what can be created from everyday things. You'll get em next year! I love this! It's amazing to see someone put so much time, effort and thought into their creations. You should definitely enter again next year! very interesting outfit and looks stunning. You are a thrifty fabulous fashionista! Keep creating, your talent will be spotted someday! 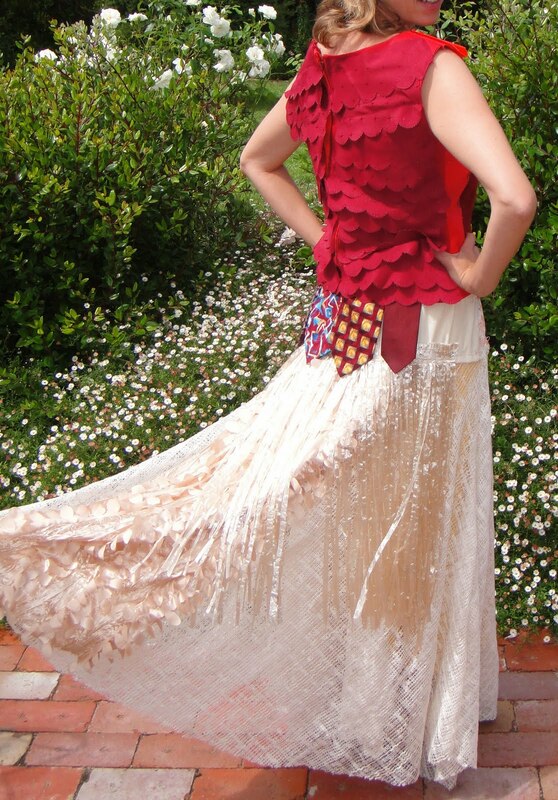 i think your frock rocks!! I was hoping to at least enter but I only had 6 days notice lol. So lets make next year our year hun!! I am really looking forward to seeing the finalists too... Hey maybe we could hold our own fabulous refashion show instead?! ps... In my eyes your dress is a WINNER! !